So, the Nintendo Community Fangame Convention is now over, and Project AM2R won the "Best of Show" award. Thanks to all the nice people at NCFC, it was an awesome event, and I'm looking forward to the next one. These screens were NCFC exclusive. Since the event is over, you can now take a look. So, in other news... I was waiting for the pizza delivery today and started playing around with some tiles. 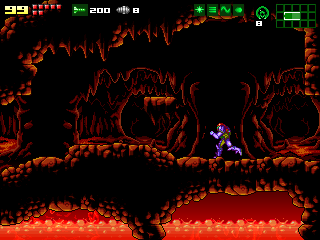 It ended up being a nice 8 bit tile mod for M:C. I also renamed some of AM2R's sprites to make a Varia and Gravity suit mod. I hope this encourages creative people to "pimp" the demo up a little more. Wow... This looks to be absolutely fantastic. I look foward to playing the completed version sometime in the future! Wow, can't wait to try these bad boys out, great work by the way. So, is there going to be a youtube video of the alpha metroid battle? wow the game looks really frackin sweet! so I'm seeing all this tech on sr388 in these pics. Is there a story to go along with that. 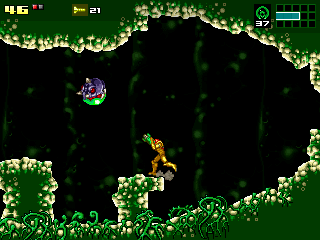 I'm guessing at something like the space pirates built it all when they got the metroids for the first game and then took them to zebes from there. 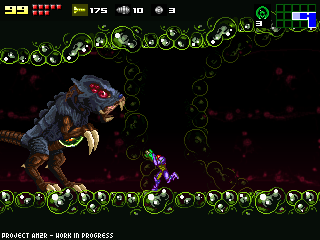 http://www.ema-designs.com/Metroid.html could be a good artist to have draw a comic series to go along with your game. Though I have one question. I don't like playing in full screen mode so I was wondering if there's any way to make Windowed mode any bigger. It's easy to make windowed mode bigger... just grab a side of the window and stretch it! that would be awesome!! widescreen, you should do it doctor m64, nice mods by the way. 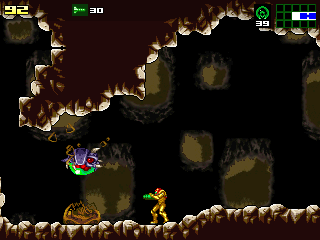 is there any way we could catch a video of you fighting the first metroid?? I read the read-me, but just want to make sure. In order to mod the suit, I just have to recolor the sprites, right? Also, does the game run full-screen the first time you run it? I think a good idea would be to enable modding for the actual game if you beat it on hard once or twice, if it's possible. I made my own mod. WARNING! D not download my mod unless you think you know the game well! I made for the real experienced. Also Dr.M64, you should like have some sort of modding compo. All I've got to say is! I CAAAAANNN'TTTTT WAIIIIITTTTT!!!!! That's a good suggestion r2 I was kinda mad that you have to hold it down. widescreen sounds really nice right now.instead of those black bars you should add the 16:9 aspect ratio which will let you view more of the game as an option in your final release. 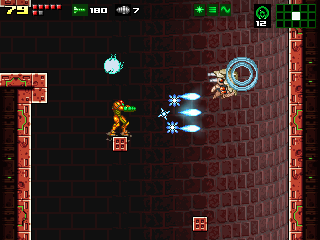 I have a question on the third to last screen-shot... You know how there are those missle regenerators and energy regenerators in Metroid 2 return of Samus well, are they there in Another Metroid 2 Remake? It would be nice if you answered this question Dr.M64, because it has been bothering me for a while now. The Gameboy-esque graphics add a nice feel to it. Superb work. >So, is there going to be a youtube video of the alpha metroid battle? Yes. I'm still compiling material from different areas to show more of the game. But if you are so desperate, I can make a small trailer showing just the metroid battles. Nope. But if we can't make that BG a nice looking tech-tower of sorts, a 4 level parallax will work. The game already keeps the aspect ratio fixed. It will be stretched if you change the resolution. You can try editing config.ini, and adding a widescreen size. >In order to mod the suit, I just have to recolor the sprites, right? You can do whatever you want, as long as you respect the sprite sizes. >Also Dr.M64, you should like have some sort of modding compo. Yes, I had no time to edit it before NCFC. >Could you put a option on the next version of the demo or in the complete game for controls like in Super Metroid? Yes, it won't be difficult. I'll add an option to make missiles switchable SM style. Do any of you want an extra aim button too? or is 1 enough? >You know how there are those missle regenerators and energy regenerators in Metroid 2 return of Samus well, are they there in Another Metroid 2 Remake? Yes. But instead of being two separate rechargers, there's going to be just one kind that refills ammo and health. I'm still not sure of how will it look like. I guess some kind of Chozo totem or something (it has to fit into small places). >Is there a way to change the beam sprites? No. But if more people are willing to mod the game, I can release an update that allows more customization (beams, normal enemies, etc.). that would be awesome! well, I am willing! I should have the phazon suit up soon. just some power grip stuff that need's to be finished. i would like to mod beams! well, yeah, i think it's a good idea! thanks i'm really looking forward to this. 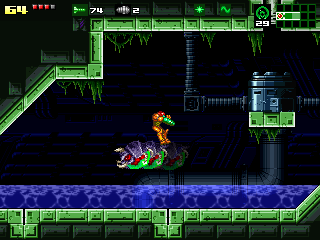 Alpha Metroid battle ASAP, plz. Can it be so we can mod everything? Congratulations to your award at NCFC 2008. Keep it up, let's have some good fun. u should just put in a certain code to get suits by mods like the virtual boy advance for roms.also can u make a gdf troop mod?it would be cool. Where's the supposed 3 links for the mods on the right side of the blog?? ?